We are one of Local Tourism Service Provider for People who Wants to Travel to Rann of Kutch. We are...View MoreWe are one of Local Tourism Service Provider for People who Wants to Travel to Rann of Kutch. We are specialize for Customized Itinerary. Kutch is the land of Art. People having different culture are interrelated in Kutch. People have developed a strong and a varied crafts tradition based on the precepts of utility and beauty. With its distinctive use of beads, printing and threads practices to create colourful fabric ornamentations Kutch has always been very popular in recent days. Each village in Kutch has a different tradition and different art. Today I would like to introduce the famous Rogan Art of Nirona, Kutch. Nirona is a small village located near Banni in Kutch. It is very famous for its crafts work. Having a variety of craftsman, there are different Colors of village Nirona. Rogan art is an ancient Persian skill which came down before around four hundred years to Kutch. It is the crafts work which is pursued to beautify different fabrics. The discerning eye will be able to distinguish this form while it may appear like fabric painting. “Rogan Kaam” does not use any prior sketched pattern and is a free hand painting style. It is done with a six inch long metal stylus. Stylus is dipped into the colour and carefully turned to wrap the Rogan around it. This detailed work is done on one side of the fabric and then folded into half to get a mirror image on the other side of the fabric. The Rogan work takes time to be done on a small fabric. The time taken is depends on the type of fabric and the complexity of the work. It may take from few days to few months also. The colours are added and then painting is done again after drying. It takes around two days to dry up. While painting symmetric patterns, to reduce the efforts, the fabric is folded from the centre to get the impression on the other half. Apart from Rogan Crafts man, traditional maker of cow bells and iron bells also live in Nirona village. These iron bells are made with bronze and copper. One can buy them indifferent sizes and shapes, emitting melodies which are soft yet carry sonorously through their desert air. If you are planning a Kutch travel then do visit this small village Nirona during your journey and you will definitely be glad that you did. “Rogan Kaam” is now practiced only in Nirona village in all over India. If you are thinking to hire a professional travel consultancy to offer a best Kutch travel package then Kutch Tour Guide is the one for you. You can visit our website to get further details. Rann of Kutch, a geographical marvel on the north-western part of Gujarat! Kutch is known for its pristine desert which is not exactly a desert by meaning, but the salt lands can eventually be described as no lesser than a desert. The land beneath is the sea-remains, the white salt grounds evenly… and with the Moon light above, this is something that you’ll crave for, the magical moments of Kutch. It’s going to be the Full moon night, and the land will again sparkle with the luminous moonlight, experience the real picture with surreal wonders of nature. The Whiteness of Great Rann of Kutch accounts to an area of 16000Km2 equal to being 3/4th of the size of Israel and greater than other countries like Jamaica. The Land of Kutch is an amalgam of artisans and their fulfilled generosity, it will make you say ‘This is Paradise’ when you make yourself dwell in this ethnicity. Witnessing the White Rann of Kutch at a full Moon night – with perfect getaways, you can plan your visit to during the full moons. Coming 11th of February is the Full Moon Night, It’s high time in Kutch with ‘Rann Utsav’ Celebration. There are several places to make your stay for the night’s glimpse like the ‘Ekal Ka Rann’ or the ‘Dhordo – scenic tent city and the Rann’, or simply dwelling at the heights of Kutch ‘Kalo Dungar’. These places can make your stay mesmerizingly wonderful. Come Visit the Rann, it’s going to be the Full Moon Night and witnessing the vast empty land with a whole lot of supreme whiteness, experience the once in a life time. Book your tickets now for amazing tour getaways at Kutch. Kutch tour guide gives special featured Packages for Rann of Kutch on a full Moon Night. Embrace yourself with the wonderful luminous skyline and the White Rann of Kutch. Request a quote to trip the Land of Kutch on a Full Moon time at Rann of Kutch. Kutch’s admiration is deep and soulful with Kutch tour Guide. Know about the travel packages and other sights to visit in Kutch. Kutch can be your travel inspiration because it’s devoid of being just a place to see. Experience the Kutch’s unending surprises. Kutch’s an exquisite place to be, and when you want to have a combination of everything that you can experience while on a tour, you should be booking your tickets now for the Kutch Tour. Here are some of the blowing facts that you can experience in Kutch. Take a look at it. 1. If you’re right on the trip to Kutch’s extreme Salt Desert, you are going to be at the world’s greatest Salt Desert here. Spread over 30,000 Km2, the Marshy Salt Land of Kutch turn’s to mesmerizing beauty with the vast sea line. 2. Kutch is the place where you can witness the scraps of the Dholavira, the very Known Best Civilization of the Past, The Indus Valley Civilization. Read about Famous Revealing of Ancient Kutch. 3. Every Year the Rann of Kutch enthralls with the famous Rann Utsav during the period of October to February. Gujarat Tourism’s esteemed celebration contrasts as one of the biggest doings in Kutch. 4. Bhuj became the center of trade and commerce due to the longest sea line of Kutch, giving rise to a capital amongst the region. It is home to the Famous Rulers of Kutch, you can find more at the Bhuj Provinces – Mahals, Lakes and Museums. Here’s a Touring Guide to Bhuj. 5. The Famous Mandvi has a Private Beach resort and a Beautiful Beach Mansion – Vijay Vilas Palace. The summer resort for the King there and the white ornamental beach, It’s a must visit to experience the breeze of the Vijay Vilas Palace. 6. Feel the divinity of Kutch at the Koteshwar Mahadev and the way old and pious Narayan Sarovar. It’s not just the Gods also feel the nature’s play. 7. Did you Know Kutch’s Ports were the prior gateway to all the trade in Gujarat. Its way more interesting to watch the Ship Building Industry and the extreme decks of Kutch. Your Travel would not just be a Visit, with a million inspirations and breathtaking insights can make you encourage about Histories of our country. Become an Extreme traveler of Kutch. 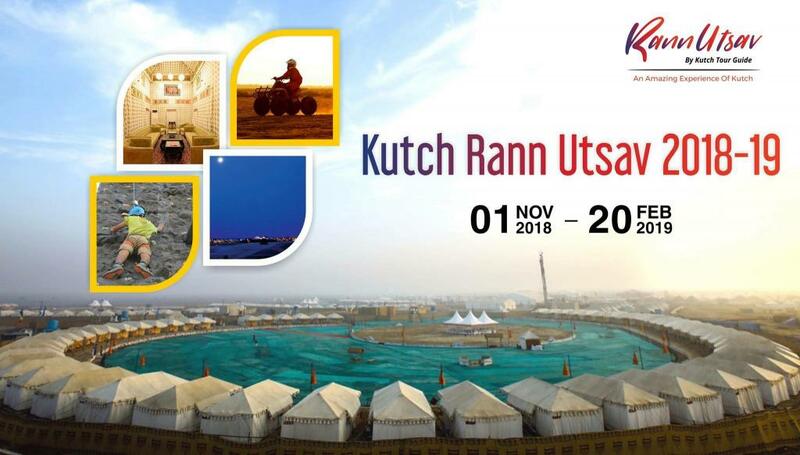 Kutch Rann Utsav is buzzing holiday destination in winters, so why don’t you visit Rann Utsav 2017 and load your bags with memories. Here at Kutch Tour guide, we provide you with various Rann Utsav Customized Packages according to your needs. But let us first introduce you all to the magnificent Kutch Rann Utsav, and what to expect during your visit to Rann Utsav 2017-2018. Rann Utsav is the cultural festival of Kutch held yearly in the vast expanse of white desert, where you can encounter various activities. The main charisma being the white desert drenched in the moonlight during a full moon, in current year there are only two full moon dates remaining on 2nd January 2018 and 31st January 2018. So have your rann Utsav bookings for these special dates under Full Moon night Packages. The Rann Utsav became famous mainly for the Tent city which is established for 3 months during the course of Kutch Rann Utsav. This might be a once in lifetime experience, where you can enjoy various adventures such as ATV rides, Paramotoring, cultural programs and much more. You should book the tents in advance, which you can do online at Kutch Tour Guide under Rann Utsav Tent Bookings. During your visit to Kutch Rann Utsav you can also visit nearby attractions such as, Kalo dungar which is the highest point in Kutch; Mandvi which is the part of coastline of Kutch there you can leave your footprints on beach sand, enjoy jet ski, camel rides etc. also you can visit the Vijay villas palace of Mandvi; you can do shopping at Kutch; visit Chari Dhand the wetland of Kutch where you can enjoy bird watching. All these activities can be included in your Rann Utsav customized packages according to your demands. So don’t just dream about Kutch, come to visit and enjoy the hospitality of Kutchi people because as Mr. Bachchan, ”Kutch Nahi Dekha to Kuch Nahi Dekha”. Get a hassle-free vacation by just one click to have your Rann Utsav Booking.